Koala breeding season is upon us, and when these randy creatures get their groove things on, they may take a moonlight stroll through your backyard. In other words, it’s a good time to review koala/dog diplomacy. 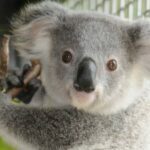 There are many steps you can take to make sure dogs and koalas don’t have unwanted encounters, according to the Australian Koala Foundation. Look for koalas in area trees. Ask neighbors if they live in your area. If they do, preventing your dog from roaming at night will ward off many koala encounters. Even if your dog is a gentle creature that enjoys playing with other animals, it’s best to keep them away from koalas because even a small bite or scratch can puncture their skin and cause internal damage. Koalas also fight fiercely, so giving them space protects your dog from injuries and lets these loveable marsupials go looking for love in all the right gum trees. You can also design fences so that koalas can’t get into your yard. You can add smooth metal or perspex strips at least 50 cm in height to existing fences. Koalas will not be able to grab it to climb over the fence. Sheet metal and other materials also can make good koala-proof fences. Keep trees and bushes at least three meters from fences to deter koala. Obedience training can also work to teach dogs to stay away from koalas. Kennels and crates can also contain dogs at night, and a bone or other special treat will encourage them to sleep there. If your dog does run into a koala, the first step is to remove your pet from the area, according to the Queensland Department of Environment and Heritage Protection. Then, contact your local wildlife care and rescue organisation by ringing the RSPCA on 1300 ANIMAL (1300 264 625). Mating seasons runs from roughly July through the end of the year. Younger, smaller koalas are also more likely to be around during this period. Fights with dogs are more common during mating season but can occur at any time of year.